The unfortunate headline-writer could have gone with "Honduras Swaps Costly for Welcome". 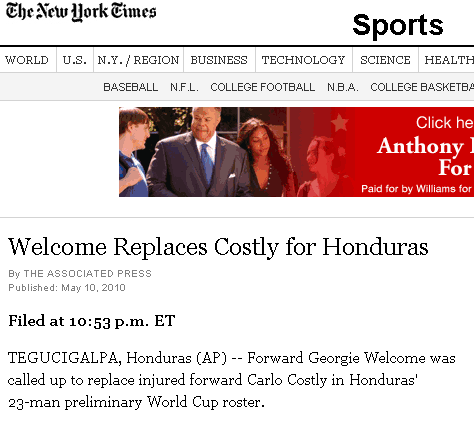 No, wait, how about "Welcome for Costly Swap by Honduras"? Some publications just gave up and went with the wordplay: "Costly blow as Hunduras striker ruled out of World Cup"; "Welcome boost for Honduras striker". My first reaction, when I saw the headline, was that welcome replaces had joined a big ask in the pantheon of heroic nominalizations. But not yet, apparently. Ummm… sentence case (losing the capital R on "Replaces") would also have a lot. "Honduras Roster Move: Welcome In, Costly Out"? I'm glad I finally read the post. I was going crazy (not a long trip) trying to figure out what Welcome Replaces Costly for Honduras could possibly mean. I'm waiting for the inevitable crash blossom concerning the new president of Nigeria, Goodluck Jonathan. There have been a lot of confusing sports headlines about "Arenas," meaning the basketball player Gilbert Arenas, not multiple stadia. which had me baffled, till I realised the first word was a proper name and not merely capitalised as the first word of a sentence. It was reporting that "Brad Bird, director of Pixar hit The Incredibles, is to helm the fourth Mission: Impossible film". The article is now titled "Incredibles' Bird to direct fourth Mission: Impossible". Today at BBC: "Ex-editor prank call protest fine". (http://news.bbc.co.uk/1/hi/entertainment/8674177.stm) It's basically just one long compounded noun: a fine has been handed out to an ex-editor (of the Daily Telegraph) for his protest (consisting in not paying his TV licence) against a prank call (made by BBC's Jonathan Ross). My father, for unrelated reasons, has a framed copy of the cover of an issue of Newsday, a New York area newspaper, from the late forties. One of the headlines on the cover is "Pick Schoolman to Buck Macy", which I have found utterly baffling all my life. The current theory, I think, is that this is a political endorsement of one Schoolman in a race against one Macy. Is this use of "Hazard" responsible for the "Hazard Center" mall in San Diego? I'm relatively new to Southern California and haven't quite gotten the courage to go shopping somewhere that sounds life-threatening. I thought the headline might mean "Honduras used to be an expensive place to visit, but now it's much more welcoming." I was thinking, by just looking at the headline that "welcome is the new costly", maybe people's attitude change toward something. Previously they thought it was too costly, but now they welcome it. The image I get is of some natural disaster in Honduras blowing away all of the welcome mats, which are costly to replace. "Welcome Replaces Costly for Honduras"
Honduras used to be known as an expensive, unfriendly place to vacation. But with the downturn of the worldwide economy, tourism is down, so the Honduran tourist industry has drastically cut prices and given their employees training on how to make their guests feel at home. "Honduras welcome Welcome but it costs them Costly." It took me over a decade after seeing it in a book to figure out what "British Left Waffles On Falklands" was supposed to convey. Of course, that was due to lacking the necessary historical and political understanding to interpret the intended meaning, but I just assumed for years that it was some sort of typographical error, since it seemed unambiguously ridiculous. @Daniel Barkalow: Not so fast. Falklands Pinguins story, though not less ridiculous, was considered real. "I thought the headline might mean "Honduras used to be an expensive place to visit, but now it's much more welcoming."" That was my reading too, after a bit of head scratching. It even fits with the sort of soft news stories the NYT often likes to publish. Also, I don't agree that the wordplayers "gave up". Certainly for the News of the World, I'm sure they were delighted by the wordplay possibilities. We're talking about a newspaper that shamelessly puns on every sporting name it can, no matter how tenuous. "Costly Replacement for Welcome", surely? Yeah, this one's a double-whammy. At first glance, it appears to be "adjective verb adjective preposition noun", and when you realize that that construction makes no sense, anyone experienced in parsing crash blossoms knows that headline writers hate verbs and if something doesn't seem to make sense, try reading what looks like a verb as a noun and assuming that the actual verb is an unspoken are/is: Welcome replaces (are/will be) costly for Honduras. This makes even less sense than before, and it turns out that the verb is, for once, actually a verb, and the problem is that not one but BOTH of the "adjectives" are actually proper nouns, and this is the rare headline that is actually a grammatically correct sentence but this fact is obscured by a "Who's On First?" naming scheme.